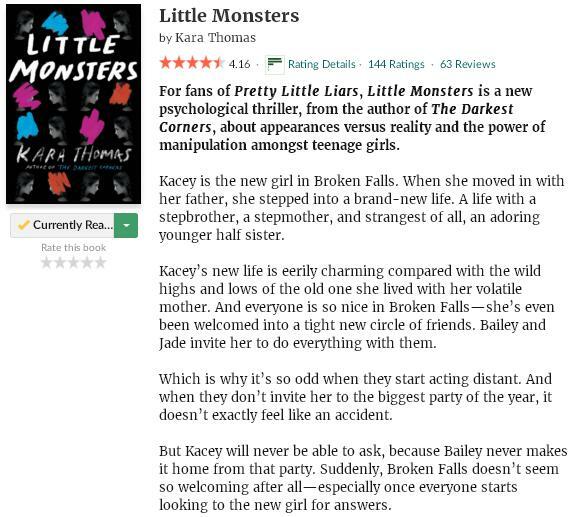 I’ve only started reading Little Monsters by Kara Thomas, another pending ARC that is going to be published later this month, last night, but so far it definitely has all the signs of being a great read. The writing style is very engaging and I’m having a feeling I will finish this story in record time… I can’t wait to pick it up again today! This entry was posted in Book Memes, Teaser Tuesdays and tagged book memes, kara thomas, little monsters, teaser tuesdays by Yvo. Bookmark the permalink. Ever since I read The Darkest Corners I’ve been really anticipating this one!! I can’t wait to hear what you think about it! I hope you enjoy it….books about teens are pretty dramatic, which can be a good thing. Thanks for sharing, and for visiting my blog.